The Ten-Tec Jupiter (Model 538), now ten years old, is at the core of my current HF station, as seen in the image at the right taken only a few minutes ago. I wrote an earlier post reprinting the review of the Jupiter I wrote ten years ago, which you can find here. That post shows I was pretty pleased with the rig in 2001. What do I think of it now that ten years have gone by? Interfacing the rig to my computer for digital modes such as PSK-31 has been tricky. I solved that problem by purchasing the SignaLink USB, shown at the top of the photograph. It’s actually a computer sound card that connects via a USB port, is made specifically for ham radio digital modes, and provides the interface to the radio. I had to insert a 10:1 attenuator to cut the transmit audio level even further because the Jupiter seems mighty sensitive to audio via the “line input.” (See update here.) Now I use it with Ham Radio Deluxe software for digital modes, mostly PSK-31. Although the Jupiter is available with an antenna tuner, I originally opted for the model without. The tuner is available as an add-on option (although I no longer see it on the Ten-Tec web page) that fits inside the Jupiter case. But I changed antennas and now use an 80-meter full-wavelength horizontal loop. The MFJ IntelliTuner automatic antenna tuner, $260, is available for less money than the factory tuner, so I purchased that and now use it with the loop and am very happy with it. Ten-Tec has continued to upgrade the firmware, adding 60-meters, a number of improvements, narrower bandwidths (down to 150 Hz), and the ability to pick between two software-defined-radios: the ordinary 538 or the CW-enhanced 538. In the CW mode, you can plug in a standard PS/2 keyboard (not USB) and use it to send CW. The mode isn’t well documented—I had to do extensive experiments with the keyboard to find out where the prosigns were hidden. But it certainly works. And, when in the CW mode, it actually attempts to decode the CW right on the radio’s screen! Doing this successfully requires that the sender be using a keyer to deliver perfectly-timed CW, plus the receiver needs to be tuned spot on the proper frequency. Doing this is relatively easy using the radio’s “spot” feature. Actually, I’ve found that the CW decoder works best when tuned about ten hertz above the spot frequency. Ten-Tec’s customer service is superb. You’re dealing with folks in Tennessee who take their ham radio seriously. My rig has been back twice: a somewhat close lightning bolt fried some of the RF input switching diodes, and again when the cat literally puked all over the screen—it got down into parts of the radio I couldn’t clean myself. Now to something that drives me nuts: AF and RF gain are set via the “multi” knob. First I press the AF button—then the multi knob is AF gain. Then I press the RF button, which turns the multi knob into RF gain. Similarly the same control can be used to set mic gain, output power, key speed, squelch (for 10m FM repeater operation), side tone level, monitoring level, and menu choices. Now I don’t have any problem with all these being on the multi knob except AF and RF gain. For default operation, I set it to AF gain, but I might be in a QSO and forget that it’s been set to mic gain. Grumble! In my opinion the AF and RF gain controls should be separate controls and always available. What I’d suggest is that the multi knob be turned into a concentric control, with AF gain in the middle and RF gain on the ring. Then what is now the PBT (pass-band tuning) knob can become the multi knob. I note that on their new Eagle radio, the AF and RF gain controls are separate. Sounds like I wasn’t the only one to complain. Believe me, if there were a way to create an outboard AF and RF gain control, I’d jump at the chance. Let’s see…Minor things: The VFO is about 20 to 30 Hz off, but is very stable with no noticeable frequency drift after power-on. If for some reason I absolutely need to get exactly on a given frequency, say, WWV, then I can use the RIT control to adjust it slightly. Turning the AF control all the way down does not tune the audio all the way to mute. When using digital modes, I can see everything I need to see on the computer screen and would like to mute the radio’s audio. Loretta has her office in the same room as my shack, and when she’s in there the residual audio of a bunch of squeaks and bloops drives her crazy. The only way to mute it all the way is to plug headphones in. The spectrum display, called “sweep,” is not terribly useful. It’s not real-time—you push the button, the radio goes mute, the display is swept (takes about 3 seconds), the result is displayed, and the radio goes back live. It a bit of a chore to switch between normal and digital modes. This involves going into the menu, changing the audio input from mic to line, cranking the power down to about 50 watts, and several other steps. I’ve built a checklist. Once the right settings are in place, it works like a charm. The Noise Reduction (NR) feature is great on noisy, crowded bands such as 80m in the evening. But it has no effect when the band is relatively quiet. The Automatic Notch (AN) feature works better if the heterodyne being tuned out is relatively strong. I use both features quite a bit. When operating on PSK-31, I can use PBT and the bandwidth control to home in on just the single PSK-31 station I’m interested in. The smallest bandwidth the Jupiter offers is 150 hz. Jupiter has modified the radio to enable some additional firmware upgrades and provided owners of the older radios the opportunity to purchase the hardware upgrade, which I did. I had trouble with installation—it didn’t work—but again Ten-Tec’s excellent customer service came into play. They sent me a special ROM to use to “reset” the processor, then the new feature ROM worked fine. So, will I keep on using the Ten-Tec? Yes, likely into the indefinite future. I’ll admit technology has moved on in the past ten years, and I’ve got my eye on a couple radios. But even if I find the cash to purchase a newer radio (the Yaesu FT-950 sure looks interesting), I’ll keep the Ten-Tec just as I did my old Yaesu FT-747. The Yaesu is my loaner rig. I’ve learned never to sell old radios—I traded in my Heathkit HW-16 and HG-10V VFO when buying my old Yaesu FT-201, and then traded in the FT-201 for some internet gear. Never again! I’ve regretted those sales. The Ten-Tec Jupiter does everything I ask of it and more and likely will continue to do so for several more years. 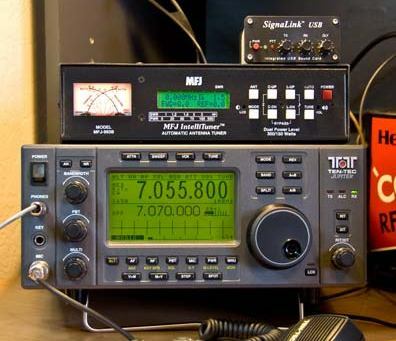 This entry was posted in Ham Radio blog entries, Product Reviews and tagged first hf radio, ham radio, MFJ IntelliTuner, MFJ-993B, PSK-31, SignaLink USB, Ten-Tec Jupiter, Ten-Tec model 538. Bookmark the permalink. I have a jupiter I bought new 15 years ago. Great rig! Excellant receiver. I had trouble with installation update. Is it possible You sent me a special ROM to use to “reset” the processor? Well I certainly appreciate your reply. I also have a Paragon II that I actually use more than the Jupiter. The clock has died, any known fixes? Hi, I own a Ten Tec Jupiter, the model with black case and blue display. Shortly after I purchased it, I began to have what now appears to be a common problem, erratic operation and looseness of the multi control encoder. I am assuming that the other controls, such as bandwidth etc are also encoders. These controls work well with no problem, and they also feel tighter when used. Do you know of a fix for the existing encoder, or of any info on a replacement? This is a very irritating problem. When easing power to the amp, or simply making general adjustments, the twitchy operation of this control is very frustrating. I also own a Ten Tec Paragon II that I certainly enjoy operating. Thanks for any help, Bob KE8EC. Do you know where to tap the 45 MHz IF for a pan adapter? Hi Angelika. I don’t know, but I find that the support folks at TenTec are very responsive. You can reach them at service@tentec.com. Good luck! The Jupiter still is an excellent radio (audio wise it beats the FT-950 by a long stretch). Here is a trick: With ALT+SWEEP you can get it to do a continuous sweep over and over again. Give the AF-knob a touch and you can also hear what it encounters during the scan. I find this useful for finding when there is some activity in an otherwise dead band. Hi Ben, here’s what I did. See description below image. On the right hand side of JP-1, pin 1 is the line audio input for the Jupiter. On the left hand side, MIC is the output of the SignaLink USB. Rather than simply connect the two of them as shown in the diagram, I created a 10:1 voltage divider. I connected one end of a 100K-ohm resistor to the MIC output on the left hand side, one end of a 10K-ohm resistor to one of the GND connections on the right hand side, and then connected the other end of both of them to Pin 1 on the right hand side, which is the Jupiter MIC input. To make life easier, I soldered the 10K and 100K resistors to a short length of wire as shown in the diagram above to make a more-sure connection. The TX level control on the SignaLink USB is still a titch touchy, but at least it’s in the adjustable range. Hope that helps. Hello Dave, I have the older Jupiter as well and recently purchased a Signalink USB and that is what has led me to your article. I’m still a bit leery about build circuits and such. Is there a diagram of the attenuator you made that you would be will to share with me? 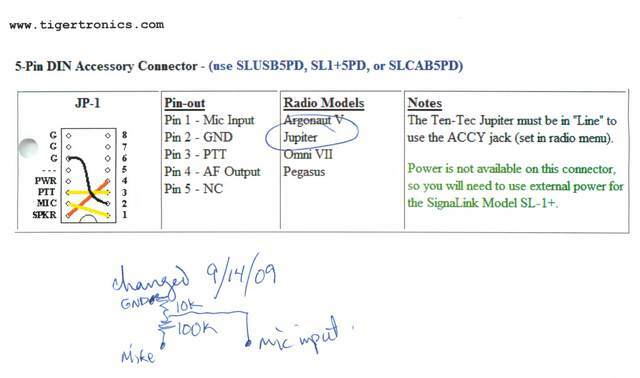 Sal, I looked into the Ten-Tec 712, which is a sound-card based interface similar in concept to the SignaLink USB that I use. The issue, which it sounds like they’ve fixed in later models, is that the Jupiter Line Input is way, way too sensitive. I had to put a 10:1 reduction network in the SignaLink to keep from overdriving the Jupiter, and even that is barely adequate. I’m almost positive that the “simple mod” is something to turn down the Line Input gain in the Jupiter. I’m as curious as you are regarding the mod, so I also queried Ten-Tec. If I hear anything, I’ll post it. And, I’ll make the mod in my own Jupiter. 73, Dave UPDATE February 17, 2012: I received a reply from Ten-Tec. See my response here. I too have an older Ten-Tec Jupiter 538 (Grey Box, Green Screen) and wanted to use their Model 712 adapter cable which allows direct connection from ACC1 to a USB port. However, there is a “note” which says the “older” TenTec 538 (like ours) requires a modification. I emailed Tentec three (3) times since Dec 2011 and have not received any information back on the required modification. Do you have any information on the modification?